The rain started at one o'clock and was steady all afternoon. 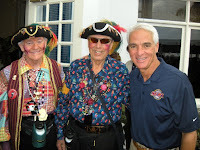 It didn't seem to dampen spirits but it did impact the crowd that assembled for the 96 year old Gasparilla Pirate Fest. What is Gasparilla ... you might ask? 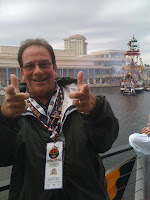 To Tampa residents, Gasparilla is ... boats, parades, pirates, booze and "merriment". Up until this year, it was also ... peeing on the sidewalk and exposing various parts of the body for gifts of beads (just like my old home town, New Orleans). When I say "up until this year" it's because this year, the police did an incredible job of reducing alcohol consumption ... the basic source of evil deeds. The name and foundation of Tampa's traditional Gasparilla Carnival come from legendary pirate Jose Gaspar, "last of the Buccaneers," who terrorized the coastal waters of West Florida during the late 18th and early 19th century. Gaspar, given to calling himself "Gasparilla," served as a lieutenant in the Royal Spanish Navy for five years until 1783 when, upon seizing command of a Spanish sloop-of-war, he with his fellow mutineers set sail for the Florida straits. And so the young Spanish aristocrat-turned-pirate began an adventurous life as outlaw of the sea. When Jose Gaspar died, he supposedly left an untold fortune in buried treasure somewhere along the Florida coast. Though that treasure has never been discovered, the story of the swashbuckling Gasparilla was unearthed and his memory revived in 1904 when Tampa's social and civic leaders adopted the pirate as patron rogue of their city-wide celebration. Miss Louise Frances Dodge, society editor of the Tampa Tribune, was planning the city's first May festival. 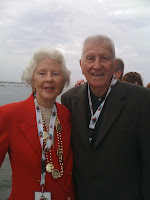 At the suggestion of George W. Hardee, then with the federal government in Tampa, she decided to develop a theme for the affair based on the legend of Gasparilla. 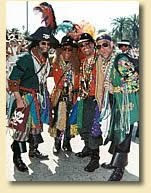 Secret meetings gave birth to the first "Ye Mystic Krewe of Gasparilla," whose forty members planned to surprise the populace with a mock pirate attack on Tampa. Masked and fully-costumed, the first krewe arrived on horseback and "captured the city" during the Festival Parade. Depending on who you talk to, there was a Jose Gaspar(illa) the pirate ... or there was no such animal. Either way, Tampa has been captured by businessmen dressed as pirates, smoking big cigars and drinking whiskey since 1904. 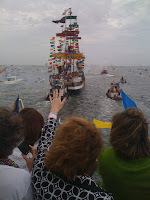 Their women follow closely behind on the Royal Barge (actually a three deck party boat) as the actual Pirate Ship (a floating barge dressed up like a pirate ship) is filled with 700 swashbucklers who land on Bayshore Boulevard and whisk away the mayor of Tampa ... in a tour bus. What follows is a parade of 104 floats and bands and beads. Vic and I judged each ... from our comfy chairs on the top floor of the Royal Barge. Our first place commercial category went to the Hard Rock Casino/Hotel float with Mike Alstott, Grand Marshall throwing rubber footballs to the crowd, the Unsinkable Krewe of Molly Brown (Grand Prize winner for their float with the Titanic sinking), The International Independent Showmen's Association (no, I didn't make that up) float won first place in the Special category for their rendition of carny food and carnival workers ... and so many more. This is me ... pretending to be a pirate capturing the city with the real ship behind me. Anyone surprised that they wouldn't let me carry a real gun? The Leavengoods ... young octogenerians and such a pleasure to be around. True treasures! 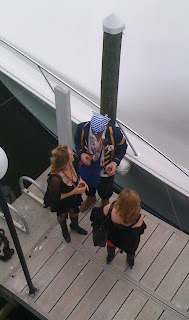 Pirate wenches gather on the dock in the cheap slutty outfits that they complain about the rest of the year when "other women" wear them. Some of our city fathers. Other city fathers (.... uhhh state fathers) Charlie without makeup and former governor Bob Martinez center WITH makeup. Bob .... I'd lose the glasses (and the rest of the costume).